The aqueducts are a few minutes walk above Halls Saddle. 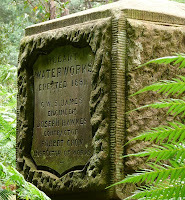 "A major problem confronting the designers of Hobart's original water supply around 1860 was how to get the water from the Mountain's southern slopes across Halls Saddle to the city outskirts. The solution was unusual in its extensive use of wooden and masonry troughing and associated sandstone features. From dams across Fork Creek and Browns River, the water had to be conveyed across Longhill Creek, (now known as Dunns Creek) to the Saddle. 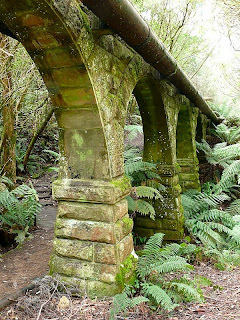 A wooden bridge carrying troughs across the creek, built in 1862, was in serious disrepair by 1880 when a contract was let to stonemason Joseph Hawkes to build two sandstone bridges designed by the Director of Waterworks, C.W.S James. Sandstone for the bridges appears to have been quarried at Gentle Annie Falls and transported up the Pipeline Track. The work was completed by late 1881. As the pipeline progressed, the working conditions in which it was excavated and constructed became colder and wetter with only several months of good weather in a year. Debates and delays in Council over construction and funding meant this good weather was lost for the contractors and workers. 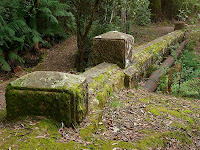 The Council took some time to agree on stone bridges as opposed to an iron siphon, and it later was in dispute with the contractor over claimed additional expenses. Much of the masonry troughing on the track has now been concealed underfoot. The cast iron pipes on the aqueducts are a later addition." From Hobart City Council sign. The Pipeline Interpretation Project. An initiative of the Fern Tree Community Association, supported by the Hobart City Council. Original research by Lindy Scripps. Lovely photo of a beautiful colonial structure.